Want to spruce up your table with some festive decor this Thanksgiving, but don't have the extra cash to spend? Steven's got a few DIY solutions to help beautify your dinner table. Watch Steven demonstrate these DIYs in today's full episode! Want to spruce up your dinner table with some festive decor this Thanksgiving, but don't have the extra cash to spend? You're in luck! 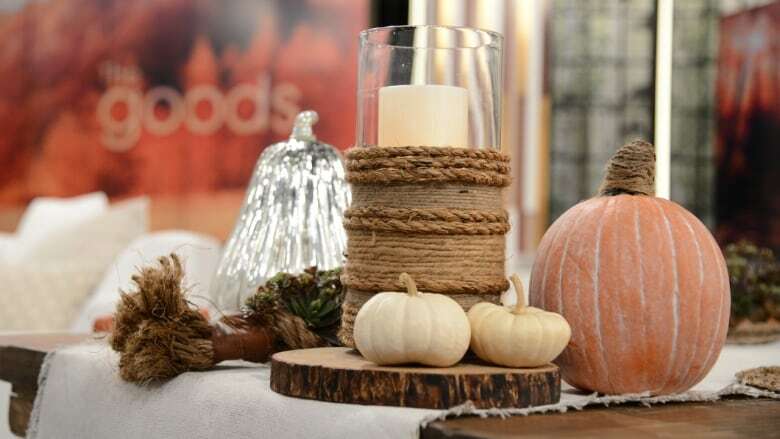 Steven's got a few DIY solutions to help beautify your table. Follow these easy steps, and you'll have 2 gorgeous centre-pieces ready before the turkey even comes out of the oven! Using your hot glue gun, attach jute or twine to the vase, starting at the bottom. Wind around vase to about ⅓ of the way up. Alternate with another type of jute or twine, as desired. Go back to using the original jute you used to start, until the vase is ½ covered. Make sure the jute/twine all end at the same point on the vase, so you have a 'seam'. Cut a strip of leather the desired width (approx 1.5"). The length should be the same height as the rope detail on the vase. Using hot glue, cover the seam with a leather detail. Remove the "pin" from the thumbtack, so you are only left with the head. Hot glue the head onto the leather detail. Add multiple heads in a straight row down the length of the leather, as desired. Draw an oval on the side of the pumpkin. It should be large enough to fit a wine bottle in it. Cut the top of the pumpkin and clean it out. Cut away a small amount of the bottom of the pumpkin so it sits flat on the table. White wash the pumpkin: mix one part water to two parts white acrylic paint. While paint is still wet, wipe excess off with clean cloth. Do additional coats until you get your desired look. Using hot glue gun, attach the twine to cover stem. 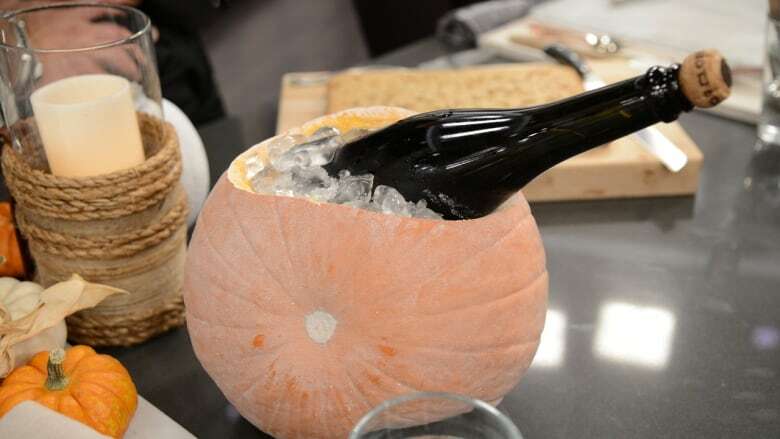 Place wine bottle inside pumpkin, and then add the ice. Voila! How'd yours turn out? Show us a picture of your beautified Thanksgiving table on our Facebook page.